Scientists have been puzzling for years to explain observations confirmed by the Hubble telescope and other sources. Where does Dark Matter come from? What is Dark Energy? Why does the Universe continue to excel and expand rather than slow down and contract? I am no Scientist and I have no formal training in this area, but I have an idea of something that may have happened in the past that could possibly explain these mysteries. I first considered this when I was thinking about where dark energy and dark matter come from and of course what each mystery is. And not being a scientist I have no way to prove or disprove any of this and it might be easily proven or disproven by those with much more experience and training than I have. Everything we know, everything we see, everything we can experiment and everything we believe to exist, did not result from a big bang or single event. What if it did not begin with a bang but rather through an event horizon of a super black hole. The universe is much bigger than we can possibly imagine and of course may be much – much older and much more mysterious. When Matter gets squeezed through the black hole it creates dark energy and dark matter out of normal matter. They get dispersed through the emptiness of space and eventually fill the void between galaxies and universes as they are formed.Matter is funneled through the event horizon in a way that follows gravity polarization. This pattern encourages solar systems, universes, and everything in between to form collections like discs or plates rather than spheres. The enormous thrust of matter is polarized as it gets sucked into the black hole. As this was not a one-time single event matter continues to be pushed through the black hole and this requires the universe to expand. Hmm very interesting! Puts my brain cells to work. Cool. I hope someone can look at this and easily disprove my theory. Until then it is a curiosity. Thank you! I’m sure some NASA trooper is now at the Planetarium, that you’ve opened the gates of the Dark Matter. I would be thrilled, even if it is to say, ‘look dude, leave the science to us, you are way off’!!!! I think I need more morning coffee for this one hehe. It is an interesting theory no doubt, the mysteries of life are endless. LOL!! Understood. Just a thought but who knows? Now time for another cup of caffeine! Thanks a lot for your comment! Me too LOL! I go through the most bizarre scenarios and try to come to a good estimated answer, then move on. I guess it is practice of that skill in some way. I am not sure in my case if there is a benefit!! hehe… well when you post a odd fun question post, we can add to it over time (hint hint). I can come out with the most craziest things. Sounds like Constant Creation, a theory of Albert Einstein’s that fell into disfavor, I’m not sure why. It may be wrong, but you’re in good company! Most of Einstein’s work took decades to understand and then a decade or two more to prove. Not surprising if we confirm more works in the years to come! Wow, completely beyond me but definitely some deep thinking here. I just keep singing ‘Super Massive Black Hole’ over and over in my mind. Beyond me too, but that is the fun of it! Maybe we turn it into a space musical??! There is music in everything. I will put that on my project list! Your theory sounds as good as any I’ve heard. I also wonder if the expansion of the universe is like lungs breathing out and then maybe breathing in again. We live in wonder. Really like it. I love how in the world of science, lots of different, varying opinions about the ‘deep’ questions are encouraged and celebrated, rather than rebuked (which is what religion seems to do). Really enjoyed this post! Thank you as I know this is of my beaten path. I could not agree with you more. I am not sure if this idea is worth considering but we are encouraged to keep looking at things differently, to be the “fool on the hill”. I really appreciate your comments. Thanks for visiting! Mumm… makes sense to me. But then I’m not a scientist either! I know what you mean! Ha. I could not argue against it or for it. 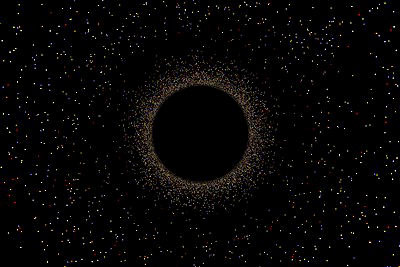 Just the idea that everything came through a black hole – and those black holes have swallowed smaller black holes. On and on, like me what I start rambling! LOL Thank you! About the only thing I can say with any confidence is that any time you get lots of dust, gas, and tiny stuff, you wind up with a disk because of drag. Any time you have a relatively “clean” environment, you wind up with a sphere(oid). Solar systems and spiral galaxies are examples of the former, and globular clusters and elliptical galaxies are examples of the latter. Both occur in nature. As for the rest (aka “the interesting parts, to me”) of your theory, I honestly can’t say. There was a recent paper that challenged the Big Bang idea, pointing more toward a continual creation / destruction model. Both fit the evidence, both could be true. So I can’t get on the bandwagon that says we have to have had a big bang. It’s up for debate at the moment. Something I find interesting in your theory is that you don’t have anything in there precluding dark matter clumping, which is exactly what we see in our surveys. It likes to group into large structures just like ordinary baryonic matter. One thing I’m not clear on, either with the current working theories or the one you presented here, is how the cosmic microwave background emission comes in. That’s the three degree kelvin background you see no matter where you point your radio telescope. When I was in school I heard two completely different explanations, both of which made perfect sense. So it’s become something of a favorite of mine, simply because you can have such different mechanisms that describe it so well. Any thoughts? See you are already over my head so I will have to check into your references and do research. Would then, the drag be due to dark matter that may have in effect surrounded the gasses as they formed. Maybe assisting in their formation? No training, but I am curious and intrigued. Thank you for jumping in! I have also been fascinated about the microwave transmissions. The universe generates a pitch. ( I can’t remember now, a Bb in a very low octave?) I will check your article links and get a better understanding. There are no answers now, but the questions are really fun. Again, thank you for your comments and time. Sounds like a great thing to be on this planet and studying everything around us. Wow. Looking forward to re-reading this and giving it much thought . Thought provoking, which is always good . I just think it is a cool and maybe even simple theory that could explain a lot – or of course nothing at all! And that is OK to. Even the material that makes our black holes came through a larger black hole, and eons from now another galaxy in a different universe/time will be consumed by our super black hole. Fun! I am honored and it is greatly appreciated. Thanks! You have to read it–it’s short (and maybe will amuse you)! I am totally impressed and appreciative. I suspect in the short time that we have known of each other, you are much like me. By that I mean, you and I look to see the similarities in people and not just the differences. Like human DNA, we are so much similar than we are different. We acknowledge the difference, but focus on the similarities, hope we are the same. I trust that people will have thoughts or views that could overshadow friendship, but the vast majority are areas where we can appreciate each other. I do not take these relationships for granted and if we were physical neighbors, I would invite you in for tea! Thank you for stepping outside your comfort zone, and I promise you are safe here! Best regards and smiley faces!!! Thank you. Agreed. Beyond what we can conceive, but so fascinating. Thanks! It is fascinating. I love it when NPR’s Science Friday does some topic about some aspect of space. I do the Science Friday during lunch at work when I can…… They are usually talking over my head, but I still love to hear the discussions. Yes, same goes for me. I’m no astrophysicist, that’s for sure. No, just a guy that likes to think about possibilities and how everything works together!